The Tri-Chip are going to be brighter. I'm very sorry, buy we don't have that information available from our supplier. Once we recieve that information, we'll post it up in our Tech page. are these considered the 5050 led strips compared to the 3528 strips? What would be required to join 2 strips to run as one continuous strip? Would it ruin the water and weather proofing? Take the positive wire from one strip and the positive wire from the other strip strip and connect them together using tape, solder, or connectors. Then run those to your power source. Same for the negative. They'll still be waterproof. Would you recommend running a 12V voltage regulator when using these LEDs as running lights in a car in order to protect them from voltage fluctuations in the electrical system? The strips work with switches, you probably need a fuse. These LEDs would face upwards. The side-emiting would face outward. These strips would be larger (wider) since you'd have to mount them facing outward. It's up to you if it suits your needs better. Sorry, we don't have this information yet on this product, but it is bright. could these lights be used in a water fountain application? .07 to 011 depending on color. I'm sorry, but we do not have them in 3-ft lengths. They use the same LEDs. Is there any plans to /develop use these Tri-Chip LEDs or similar on an updated Side Emitting "Headlight" LED Strip? Can you tell me if you have a strip available for a 1 ft. tailite that would include stop -running & brake lights in one unit or would I have to run separate strips? You'd have to have 2 strips to do that. When I cut every 3rd LED, can I use the strip that I cut and solder on to the rest of the other LED strip? I see that there's a positive/negative sign every 3rd. Though its not really clear since I'm viewing this on my cell. I think another customer asked the same question but just want to be sure. Yes, if you cut, you can reuse the end you cut by soldering. This product is available in 1 foot lengths. We can certainly make a custom length, but we'd ask for a minimum order of at least a few hundred strips. Perhaps you should consider our Waterproof Ribbon LED Strips which are already available in a wide variety of lengths to suit your needs. The brightness is the same. While these use brighter LEDs, the prewired LED strips use more LEDs. I know that the ribbon appears to be able to bend from front to back very easily, but is there any up/down flexibility at all? The application I want to use these for is flat, but makes a wedge shape at the bottom. Would these have enough give to contour to the wedge, or would the flexible led strips be more suited to my application? There is a little, but not too much. You wouldn't be able to use the adhesive on the bottom for that application. You'd have to rig up something else. Possible solutions: attach the strip to something under the Killer Glass, use a similar double-sided tape and put it in places in between the LEDs so it doesn't block any light. The temperature rating has not been tested. However as long as the strips are not mounted to anything that gets too hot (like exhaust manifolds or radiators), it should be just fine. Many customers have used various flexible LED strips in their engine bays with great results. Yes. 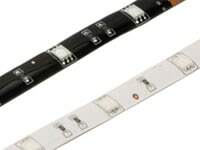 You may also want to consider our Pre-wired Waterproof Ribbon LED Strips which are already available in a pre-wired 3 foot section. From the center of each LED, the distance between each LED is 1.3 inches. how thin are these strips? Not at this time. Any connector we could use would destroy the extremely thin and small footprint of this strip. Thanks for understanding! Does the yellow strip emit a yellow glow or amber? if amber, which of the colors will be closest to yellow? Warm White would be the closest natural 'yellow' color, but it will not be a day cast yellow, but a warm one. The 'Yellow' , like most other LEDs is more of a pumpkin amber, as seen in the 'More Photos' section - Regardless of the color, they are sure to impress. Looking forward to your order! Good question! When you order a quantity of 4, you will receive 4 separate 1ft strips. The angle is closer to 110 to 130 degrees. How is it plug and play can you show pictures? More pictures will be coming soon. The plug in application is 2 wires, positive and negative that will hook directly up to a 12V source. You may also use our AC Adapters to allow you to plug into a standard 110V outlet. These are 1 foot long. With 9 perfectly spaced LEDs per foot, you can be sure to get that even light spread we all desire, even when mounted close to another surface. These over-sized LED modules throw a wide spread angle of light, which always is pleasing for ambient lighting purposes.